Telangana Chief Minister K. Chandrashekar Rao has announced a 43% fitment in pay scales on February 2014 to all the Telangana State government employees. The hike in salaries will be implemented retrospectively from June 2, 2014 and the new salary will be paid from March . This decision would benefit over 4 lakh Telangna State government employees and 2.4 lakh retired staff by June 30th, 2014. 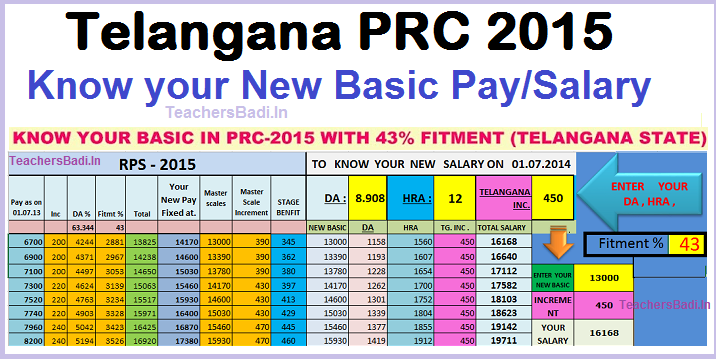 It was the first PRC implementation for TS Employees after the formation of Telangana. KCR announced that the Pradeep Chandra Committee will continue its work to look into such further issues in PRC. The Government Order on Telangana PRC Fitment will be issued today onwards. Presently Orders were not released yet. I am retired on 30-09-2013.My basic as on 01-07-2013 was Rs.50560/-. I was sanctioned one increment Rs.1200/- in the month of Aug 2013 ( Rs. 50560 + 1200 = 51760/- ).My Service pension is Rs. 25880/- and Normal Family pension is Rs.15528/- after 40% commutattion ( Rs.10352/- commuted value ). How to calculate to arrive new gross pension and Arrears--Manmohan. Sir ur new basic as on 01-07-2013 is 105810. with increment as on 01.08.2013 is 108330. Ur new service pension is 54165. now ur commutation is caliculated as per new pay but with old table. 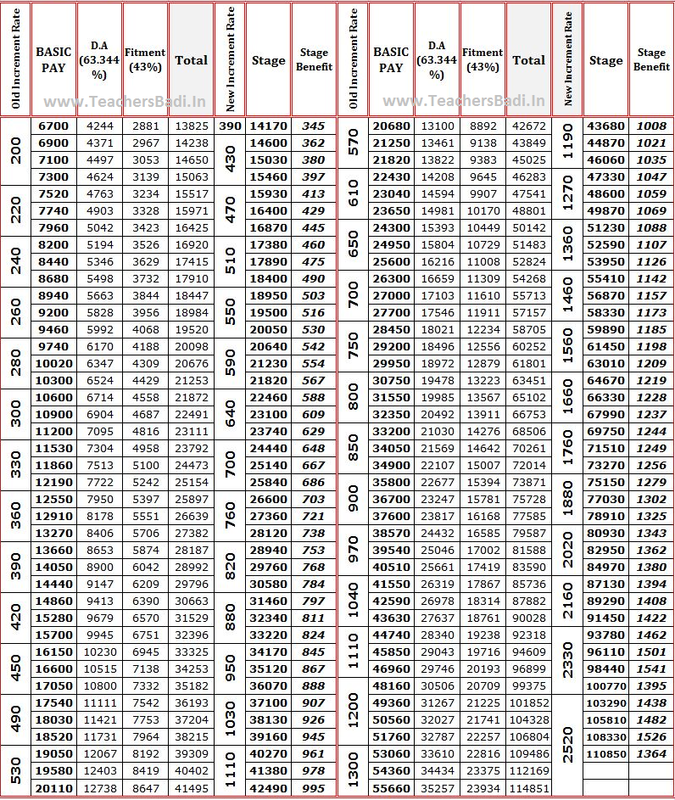 And u hav to get 54165+ D.R @8.0908% -commutation. At first instance ur mother basic pay has been re fixed in RPS-2015.Then caliculated service pension of ur mother. And then only deciced family pension to ur father. My father was working in irrigation department, So due to health condition he was given voluntary retirement Apr 1st 2015. Unfortunately father was expired on 16th June. Still voluntary retirement is approved or not I am not sure. I am working as software Engineer(Unix Platform) So can I get Govt gob? My age is 33 now i have total 8 years of experience working on various IT company’s. If I get the job how much salary I can except.? Apply through the Website of Department and also from State Portal. (Better). First you apply for the Post in Department to claim the Job of your Father. Apply the post of Job, through the Post Register through Ack Due. Then you talk to the department Head of the Department. They will give you the job. Government Job is far batter than IT Job. My basic was 11500 when its was registered in Andhra Pradesh. Now in the under of Telangana government it is 12000. can you tell ne other benifits ? or how much my ctc would become in payslip ? Can anyone help me with the current salary for Junior assistants in any department??? I mean the basic salary along with net salary after deductions?? ?